The Kannada people, known as the Kannadigas and Kannadigaru, are people who natively speak Kannada and trace their ancestry to Karnataka state of India. Kannada language belongs to Dravidian language family. Significant Kannada minorities are found in the Indian states of Maharashtra, Tamil Nadu, Andhra Pradesh, Goa and in other Indian states. The English plural is Kannadigas. Modern Kannada stands among 30 most widely spoken languages of the world as of 2001. Settlement in Karnataka is found to be existent at least from the 2nd millennium BC as explored in Brahmagiri archaeological site near Chitradurga district, central Karnataka. Chandravalli exploration has revealed interaction of Roman and Chinese travelers around the 2nd and 3rd century BC. Talagunda and Halmidi stand as the oldest excavated inscriptions as available today. The language was once popular from Kaveri to Godavari as mentioned in the Kannada classic Kavirajamarga of 850 CE. Archaeological evidences show Kannada inscriptions found as far north as Madhya Pradesh (Inscription of Krishna III) and Bihar. The great Karnataka Expansion provides insights to kingdoms of northern India whose originators were from Kannada country. Minor dynasties that have played an important role in the development of Kannada, culture and polity were Chutus of Banavasi (feudatory to Satavahana Empire), Tuluva Dynasty of Canara, Rattas of Saundatti (Belgaum), Guttas of Guttal (Dharwad region), Banas of Kolar, Nolambas of Nolambavadi, Vaidumbas, Chengalvas, Kongalvas, Sendrakas of Nagarkhanda (Banavasi province), Yalahanka Nadaprabhu kempegowda, Sindas of Yelburga (Bijapur-Gulbarga), Kadamba of Hangal. In addition to those empires that ruled from the Karnataka region, based on inscriptions and literary evidence historians have discussed the possibility that kingdoms of Kannada origin were established in other parts of India as well. The Karnata Dynasty (founded by Nanyadeva I) of Mithila and Nepal, However contrary evidence also suggests that this dynasty may have been of Parmar Rajput origin. Architecture and Sculpture has been the epitome of art in Karnataka. Be it the musical pillars of Hampi, which is listed as a UNESCO World Heritage Site, the ekashila (monolithic) statue of Gommateshvara Bahubali that was voted by Indians as the first of Seven Wonders of India, the Yelu Sutthina Kote of Chitradurga (The Fort of Seven Laps) cutting across hill or the wholesomeness of carvings of temples which bared down all desires to be left out of it and formless (above all forms) all encompassing — the inner garbhagrihas. The temples of Karnataka had in them many shaili or varieties to credit. A majority of the temples were built using the locally available stones. 57-foot monolithic statue of Gommateshvara Bahubali dated 978–993 AD. Traditional folk house with courtyard and tulasi katte. Elephanta Caves island was a summer resort of Rashtrakuta kings and is declared as a World Heritage Site by UNESCO. Konark Sun Temple also called Surya Devalaya and Black Pagoda built in coastline of Odisha, India by Narasimhadeva I of the Eastern Ganga Dynasty is declared as a World Heritage Site by UNESCO. Ajanta Caves have sculptures of Rashrakutas and Badami Chalukyas and is declared as a World Heritage Site by UNESCO. Dasa Sahitya is the literature of Bhakti movement composed by devotees in honor of Lord Vishnu or one of his avatars. Dasa is literally "servant" in Kannada and sahitya is literature. Haridasas ("servants of God") were preachers of Bhakti to Vishnu. The bhakti literature of these Haridasas is collectively referred to as Dasa Sahitya. It is composed in the Kannada language. The Haridasas richly contributed to the heritage of Karntataka music. They made an indelible impression on the religious and cultural life of Karnataka by spreading the didactic teachings in a musical form to the hearts of the common folk. Like other doyens of Indian classical music, these scholars offered prayer to Vishnu through music, called naadopasana. The Lord is described as Samagana priya, and bhakti through music is the most preferred path to 'reach' Him. The Haridasa compositions are popularly known as Devaranamas. Compositions like Krishna Nee Begane Baaro, Venkatachala Nilayam, Jagadoddharana, Tamboori Meetidava are some of the many examples of their scholarly work. Veena is the most commonly used instrument in Carnatic music. Purandara Dasa, widely regarded as Karnataka Sangeeta Pitamaha or "Father of Carnatic music"
One of the oldest forms of music in the region is Karnataka Shastreeya Sangeetha which has evolved over ages. Both Hindustani and Karnataka variations are respected and nurtured by Kannadigas. Bhavageete and Sugama Sangeetha are some innovations. Other forms of music include Gamaka, Joogera Pada and Lavani. Yakshagana is considered a unique and indigenous form of both music and dance of Karnataka. Veene Sheshanna (1852-1926) notable Veena player and composer. Rangabhoomi or the theater culture is a tradition with Kannadigas. While a lot of gadhya (literature) is written in praise of the heroic characters of the epics and puranas, there are major works depicting the kings and their rule. These are called Naataka (plays having wide-ranging stages for performance like Rangamancha staged in either theaters or on streets) and Bayalata (ಬಯಲಾಟ). As its etymology indicates, bayalu means open-air field and ata means theater. In southern Karnataka, the eastern and western varieties of Yakshagana are termed Bayalata, whereas in the north several other distinct genres are included under the name. Harikathe which covers an entire night is another form where one (or more) person tells a story in an outstanding manner accompanied by music at background. It is a common feature to narrate battles, stories, devotions or vratha in front of temples on auspicious days like Dasara and Maha Shivaratri. Harikathe is a composite art form composed of story telling, poetry, music, drama, dance, and philosophy. Today, late-night Harikathe sessions are organized overseas where Kannadiga population is considerable. Vasanta Habba (ವಸಂತ ಹಬ್ಬ), which means "spring festival" in Kannada is a cultural festival organized by the Nrityagram foundation in Bengaluru. It is a very popular event and is considered the classical Woodstock of India. First held in 1990, it now attracts the best musicians, dancers and cultural artists from across India. Similarly,'Bengaluru Habba (ಬೆಂಗಳೂರು ಹಬ್ಬ is a congregation of art performances at places in the city which is successfully celebrated every year. It aims to provide aesthetic entertainment to a wide cultural, social and demographic cross-section of the city's people by partnering with corporates and other stakeholders since 2003. In 2006, the Government of Karnataka tried to bring the folklore and art into the city of Bengaluru by initiating Jaanapada Jaatre (ಜಾನಪದ ಜಾತ್ರೆ) which was hugely successful and received well by art lovers. It is usually held on select weekends in Lalbagh and other parts of the city. Some famous theatrical, cinematic and television personalities like T P Kailasam, Gubbi Veeranna, C. Honappa Bhagavathar, G V Iyer, Dr. Rajkumar, Puttanna Kanagal, Kalpana, B. S. Ranga, B V Karanth, Girish Kasaravalli, Shankar Nag, T.S. Nagabharana, T N Seetharam have contributed for its richness. The mystic and spirited reliving of legends and epics are the major depictions in dance forms. With the theater of battle scenes of heroism, loyalty and treachery, colour and pageantry are the main subjects. More are adapted with the course of nature and seasons adding colour to the harvesting seasons. Tribal forms of dance can be found limited in the regions inhabited by Soligas, of which Pinasee is a traditional dance form. The people of Kodagu in the Western Ghats also have their own dance forms. The martial arts more prevalent in parts of North Karnataka with Garadi Mane present in every village and a head to train the youngsters into fit individuals. Kusthi, Malla Yuddha, Kathi Varase (which can be seen depicted in Veeragase and similar to sword fighting), Malla Kambha (gymnastics on a pole structure with/without rope) are some of the prominent arts practised. The Mysore Odeyars arrange kaalaga or fights like Vajra Mushti during Dasara festival which is made less frightening these days as they are publicly staged. Rock lifting, Bull race, Kusthi, and Kabaddi are popular sports. Yogasana, Praanayama and health-related camps are very popular throughout the state and some of the best Yoga practitioners can be found here. Art of Living is one such organization immensely popular all over the world. Kannadigas celebrate festivals throughout the year presenting the diverse culture and belief of the ethnicity. Festivals have varied reasons to celebrate. Agriculture: Upon onset of monsoon, sowing or harvest there are festivals celebrated like Chaandramana Ugaadi (marking of new year), Makara Sankranthi and Huttari. Monsoon: Dasara/Navarathri, Ayudha Puja, and Deepavali. Puraana: Maha Shivarathri, Varamahalakshmi Vrata, Bheemana Amavasye, Swarna Gowri Vratha, Ganesha Chaturthi, Naagara Panchami, Ratha Sapthami, Krishna Janmashtami, Rama Navami, Vijaya Dashami, Vaikunta Ekadashi, Naraka Chaturdashi, Bali Padyami and others. In the countryside, a dana jaathre (livestock fair) is held which is a conglomeration of people where a local demigod is worshiped and a ratha or theru (chariots) are moved by the bhakthas and daasoha (free food) is arranged for the visitors. North Karnataka has a unique blend of Hindu and Muslim brotherhood with people celebrating festivals in unison and exchanging goodwills owing to great revolutionary Shishunala Sharif and Guru Govinda Bhatta who had displayed their religious tolerance and spiritual unity of all religions. Christmas is celebrated at large in Bengaluru and Mangalooru which host some of the oldest churches and educational institutions of the country. Buddha, Mahaveera, Shankara, Basavanna and Gandhi are remembered on their birth anniversaries. The cuisine of Karnataka includes many vegetarian and non-vegetarian dishes. The varieties reflect influences from the food habits of many regions and communities from the three neighbouring South Indian states, as well as the state of Maharashtra to its north. Soopa Shastra is notable medieval Kannada literally work written in 1508 A.D on the subject of Kannada cuisine. Some typical everyday dishes in Kannadiga homes include Bisi Bele Bath, Jolada Rotti, Ragi Rotti, Akki Rotti, Saaru, Huli, Davanagere Benne Dosa, Ragi mudde, Chitranna (lemon rice) and Uppittu. 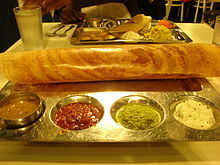 The famous masala dosa traces its origin to Udupi cuisine. Plain and rave Idli, Mysore Masala Dosa and Maddur Vade are very popular in South Karnataka. Kadabu, a kind of rice dumplings, is a popular and ethnic food in South Malnad regions such as Sakaleshpura, Mudigere, Somwarapete, etc. and is consumed with huchellu (black sesame) chutney. Among sweets, Mysore Pak, Dharwad Pedha, Chiroti, Belagavi Kunda are well known. Hurnagadab, Hurnaholige, Karadantu of Gokak and Amingarh, Shenga Holige and Sajka have origins in the Malnad region. Indis (chutneys) of Karnataka have a very distinct taste and flavour. Some popular ones include Shenga indi (groundnut), Agashi indi, Karal indi, Inichi indi and Mavina indi (mango). Similarly, Karnataka uppinakai (pickles) too are very distinct from the rest like Mavina thokku (fine mango pickles), Nimbekai uppinakai (lemon pickles), Tenga Mavina uppinakai (entire mango pickle), gaajri uppinkai (carrot pickle) and menshinikai uppinakai (chili pickle). The costume of Kannada people varies from place to place. The Kannadiga male costume mainly include Panchey (some tie as Kachche) or Lungi (wrapping style depends on the region), Angi a traditional form of shirt and Peta turban worn in Mysuru style or Dharwad style. Shalya is a piece of long cloth which is put on shoulder commonly seen in countryside. Many use Khadi in their clothing till date of which politicians are prominent ones. Female costumes include Seere of which Ilakal Seere and Mysore silk are famous. Seere has variations of draping depending on regions like Kodagu, North and South Karnataka and Karavali. Young women in some parts of Karnataka traditionally wear the Langa davani. Kasuti is a form of embroidery work which is very popularly sought-after art on dress and costumes. An Urban male costumes comprises a trouser, shirt and sandals while that of females include shalwar and moderate heeled sandals. Jeans are popular among the youth, while new age Khadi/silk printed with art or emblem also find place. Karnataka has the only village in the country which produces authentic Indian national flags according to manufacturing process and specifications for the flag are laid out by the Bureau of Indian Standards at Hubli. Kannada literature is filled with literary figures and pioneers all through. With an unbroken literary history of over a thousand years, the excellence of Kannada literature continues into the present day: works of Kannada literature have received eight Jnanpith awards and fifty-six Sahitya Akademi awards. Pampa, Ranna and Ponna are considered as three jewels of Old Kannada (Halegannada). Janna was another notable poet of this genre. Basavanna, Akka Mahadevi, Allama Prabhu, Madhvacharya, Vidyaranya, Harihara, Raghavanka, Kumara Vyasa, Sarvajna, Purandara Dasa, Kanaka Dasa, Shishunala Shareefa, Raghavendra Swami etc. were pioneers of Nadugannada. All these have been inviolved with social and cultural movements and hence this was the golden era of literature which brought about a renaissance in Kannada literature. They all had a characteristic naamankita (insignia) which would denote a power equaling a God in popular comparison. The literature saw the Vachana (said), Tattva (that-ness), Sharana (saviour of God), and Dasa (servant to God) Padas (short poetries) reach the common man's ignorance into great depths leading to Siddhanta (philosophies). Kuvempu, D. V. Gundappa, Da Ra Bendre, B. M. Srikantaiah, Masti Venkatesha Iyengar, Shivaram Karanth, V K Gokak, U R Ananthamurthy, P. Lankesh, Girish Karnad, G S Shivarudrappa, Gorur Ramaswamy Iyengar, Pu thi Narasimhachar, Chennavira Kanavi, Gopalakrishna Adiga, TaRaSu, A N Krishna Rao, Govinda Pai, S.L. Bhyrappa, Poornachandra Tejaswi, Thriveni, K. S. Nissar Ahmed, K.S. Narasimhaswamy, Chandrashekhara Kambara, Siddhaiah Puranik, G.P. Rajarathnam, T P Kailasam, Anupama Niranjana, M. K. Indira, M M Kalburgi, T. V. Venkatachala Sastry, Dodda Rangegowda etc. are popular literary figures. This period was amalgamation of literature works which crossed across boundaries under a vast roof encompassed by art and theater fields. The literature works of Kannada in Navodaya is crowned with eight Jnanpith awards. Kannada Thantramsha or software is developed under Kuvempu University. There is a sizable Open-source community based in Bengaluru. Academies operating as its wings include Tulu, Konkani, Kodava, and Urdu. A Byari academy is the latest academy opened in Karnataka. Noted travellers and linguists have also contributed during pre- and post-imperial era like Germany's Ferdinand Kittel, England's Thomas Hodson, Persia's Abd-al-Razzāq Samarqandī and China's Huen-tsang. Bhashyam Bhashyachar published "Mysuru Vrittanta Bodhini" in 1859. Mangaluru Samachara was the first Kannada news publication as early as 1843 by German missionary Hermann Mögling. Followed by Bhashyam Bhashyachar who is credited with publishing the first Kannada weekly from Mysore "Mysuru Vrittanta Bodhini" in 1859 under the royal patronage of Krishnaraja Wadiyar III. Shortly after Indian independence in 1948, K. N. Guruswamy founded The Printers (Mysore) Private Limited and began publishing two newspapers, Deccan Herald and Prajavani. Presently the Times of India and Vijaya Karnataka are the largest-selling English and Kannada newspapers respectively. D. V. Gundappa was notable Kannada journalist, he was awarded third-highest civilian award Padmabhushan in 1974. N. K. Naik - Professor Emeritus at IIT Bombay. Raja Ramanna - Indian nuclear scientist and father of the Indian nuclear bomb. Dr. M.C. Modi - Ophthalmologist and humanist. K. N. Shankara - Indian space scientist and master in satellite payload technology. Vivek Murthy American physician serves as the 19th Surgeon General of the United States. Narayan Hosmane - Biochemistry and Cancer research. S. K. Shivkumar - Scientist, ISRO telemetry (ISRO), associated with Chandrayaan-1 lunar probe. Roddam Narasimha - senior scientist IISc, chairman JNCASR. C. R. Rao - Statistics, Mathematician. Professor emeritus at Penn State University. Shrinivas Kulkarni - Professor of astrophysics and planetary science at Caltech, United States of America. S. Shankar Sastry - Dean of the College of Engineering at the University of California, Berkeley. L. S. Shashidhara - Developmental biologist, geneticist and a professor and chair of Biology at Indian Institutes of Science Education and Research (IISER). M. Visvesvaraya - Indian scholar and engineer, who also served as the Diwan of Mysore. Karnataka is one of the few states which, while a leading contributor for GDP of the country and home for industries, has preserved its forests and wildlife. The evergreen Sahyadri and Western Ghats are home to protected Wildlife of Karnataka. The Kannadiga culture protects and balances Kaadu (forest) and Naadu (state) as can be seen. Although seen scantly still the state enjoys the diversity owing to tribal sects of Soliga, Badaga, Jenu Kuruba, Hakki Pikki, Lambani, Siddis and other inhabitants of forests. See Appiko Chaluvali. The Puranas describe the region as Kishkindha in the age of the Ramayana. There is also literary evidence that the region of Mysore was called "Mahisha Mandala" after the mythological demon Mahishasura. Parashurama and Hanumantha are some epic characters to be cited relating to this place. One of the most popular and acknowledged Jaanapada songs is "Dharani mandala madhyadolage" which narrates an incidence between mother cow and an aggressive tiger in a place called Karnataka. Karnataka as now can be viewed as a multicultural state — almost all the religions that can be found in India can be found here and there has been lot emigration as well due to which multi-ethnic diaspora can be seen. As the kingdoms provided a safe centres for development of all cultures we can see a huge diversities from region to region. Even the language and dialects varies from place to place. The language has evolved distinctly in both the backyard (folk/basic/prakrutha) and frontyard (refined and related to Samskrutha/Sankrit) of the culture. It can be said that the major works of Sanskrit have originated and continues to evolve here. Shringeri, Udupi are some of nerve centres. One of the leading examples include a village near Shivamogga where people speak only Sanskrit till date. Bengaluru has almost all language speakers of India. One of the most acknowledged concept is to be a Vishwa Maanava or universal being. In Kuvempu's ideology this has a renowned explanation "Every Child is born as a Vishwa Maanava or a Universal Human. It is we who make him Alpa Maanava or Little Human by putting various constrictions of borders rituals and castes. It hence becomes responsibility of our culture to again make him a Universal Being unbound and free." The Kannadiga culture is known to provide shelter and self-respect to people by owning them and their culture. Two colonies for refugees from Tibet are formed, one near Mundgod and one near Kushalanagara, protecting them from Chinese atrocities. Karnataka has sheltered flood victims of northeastern India like Assam and provided them jobs. One of the easily seen diversity is the surnames which vary from hugely like some may involve names involving a Hindu and Muslim name or having a Hindu Christian name (more found in Mangalore) or even a Muslim Christian name. Karnataka and parts of Maharashtra are the only states which have diversity of including Malenadu Nithyaharidwarna — evergreen ghats and Bayaluseeme which have different ways of living in the same state. Not only this but it acts as a gateway to North and South Indian cultures. It may come as a surprise that Karnataka is next only to Rajasthan in India when it comes to area under arid land but still Southern Karnataka is referred to as Gandhada Gudi — temple of sandalwood found in its protected forests. After the Odeyar era who already had established democracy by naming elected representative called Saamantha in southern regions as early as the 19th century, the 1947 partition brought a centre into being under democracy and Karnataka accepted a bicameral legislature. But this was a functionally a failure as there always has been a tug of war from centre and states to an extent that from the 1990s to 2010 there have always been different political parties operating at centre and state. North Karnataka had other problems of getting independence more from Nizams. So there were two spheres. Lack of will and coordination and constant fights have been hallmark of politics which has prevented a regional party/media from arising in the land. Kerala being a neighbour where hugely successful communist ideology in bringing up literacy levels has a backing here and a few naxalite outfits function in Karnataka. Functional failure of all pillars of democracy even being upper riparian state can be clearly seen in the Kaveri River Water Dispute issue. The failure extended to bureaucracy and Karnataka reached the position of being fourth most corrupt state of India due to political and bureaucratic lobby. Because of this, Lokayukta (see N. Venkatachala) was formed but could not get the required powers to deal with the powerful. In the field of press and journalism P. Lankesh and S. Gurumurthy are some of the noted ones famous for their leftist affiliations. Horanadu Kannadigas (or non-resident Kannadigas) are Kannadigas who have migrated to another state or country, people of Kannada origin born outside Karnataka, or people of Kannada origin who reside permanently outside of Karnataka. N R Narayana Murthy, speaking at the 2011 World Kannada Conference, opined that Kannadigas who move out of the state are respected everywhere. Although the failure in political arena has reflected in the cultural isolation of emigrants, some of the successful functional bodies include Singara (Singapore), Dehali Kannadiga (New Delhi), Mumbai Karnataka Sangha (Mumbai), Mallige Kannada Balaga (Mauritius), North America Vishwa Kannada Association (NAVIKA) and Association of Kannada Kootas of America (AKKA) in the United States have promoted cultural involvement through events such as Kannadotsava. The Kannadiga diaspora are found all over the world, mainly in the USA, the United Kingdom, Singapore, the UAE. After occupying Mysore, British had baited 8 acres & a Rs 75 salary for battalions for World Wars from Karnataka. Kannadiga regiments got disbanded after world war 2 as per Imperial War Museum records, as historians still debate about exclusion of revolts from south of Vindhyas against British Indian Army. From September 1939 until August 1945, recruitment was done at Regimental Centre at Belagavi for the Madras Regiment, the Mahar Regiment, and the Lingayat Regiment. In 2017, a panel has been setup to look into legalities of separate flag for Karnataka. During the period of British rule, state of Karnataka as it stands today did not exist. Areas that today comprise Karnataka were under as many as 20 different administrative units with the princely state of Mysore, Nizam's Hyderabad, the Bombay Presidency, the Madras Presidency and the territory of Kodagu being the most important ones. In effect, nearly two-thirds of what is now Karnataka fell outside the rule of the Wodeyar kings of Mysore. In addition the proposed state had six neighbours — Goa, Maharashtra, Andhra Pradesh, Tamil Nadu, Kerala — and all had Kannadigas along the borders overlapping these regions. What this meant for the Kannadigas in these regions was that they were reduced to linguistic minorities wherever they were. Kannadigas in the Hubli-Karnataka region for example, came under the rule of the Bombay presidency where Marathi was the official language. Those in the Hyderabad-Karnataka region came under the Nizam's rule where Urdu ruled, while in Mysore Kingdom, Kannada was the official language. It was in this backdrop that the movement that first started as a protest against linguistic oppression, soon morphed into one that began demanding a separate state be created consolidating all Kannada speaking regions. This was essentially a movement that was spearheaded by the poets, journalists and writers and was called the Ekikarana or 'Unification' movement. India gained independence in 1947. The joy of independence soon gave way to disappointment as the new government started dragging its feet on Karnataka Ekikarana movement. Kannada speaking areas now got grouped under five administrative units of the Bombay and Madras provinces, Kodagu, and the princely states of Mysore and Hyderabad. The Akhila Karnataka Ekikarana Parishat met in Kasargod and reiterated the demand for a separate state for Kannadigas. The ratification in parliament of the recommendations of the Fazal Ali Committee brought joy to the Kannadiga population that now was merged under the state of Mysore. On 1 November 1973, under Devaraj Urs as chief minister, Mysore state was renamed as Karnataka since it was felt that Karnataka was more 'inclusive' of all the other regions of Karnataka than the name Mysore. The Kannada ethnic flag is a banner with two horizontal stripes, yellow on top and red on the bottom. The flag neither is official nor represents any legendary empire but has become accepted in recent times representing a symbol of culture and welfare.The flag was first conceived by Ma Ramamurthy, a Bangalore-based writer, journalist and social activist, often considered as a commander of Kannada movement in 1960s. ^ "Encyclopedia of World Cultures - Canarese, Kannadiga". Encyclopedia.com. Retrieved 17 September 2013. ^ "Indiaspeak: English is our 2nd language". Times of India. 14 March 2010. Retrieved 12 February 2013. ^ "Kannadigas outnumber Malayalis 2:1 in Tamil Nadu". Times of India. 15 April 2008. ^ "The Journal of the Bihar Purävid Parishad, Volumes 4-5". p. 414. Retrieved 26 January 2017. ^ "Mithila Under the Karnatas, C. 1097-1325 A.D". p. 55. Retrieved 26 January 2017. ^ "History of Muslim rule in Tirhut, 1206-1765, A.D." p. 28. Retrieved 26 January 2017. ^ "The Journal of the Bihar Research Society, Volume 46". pp. 22–25. Retrieved 26 January 2017. ^ "Publications, Volume 33". p. 193. Retrieved 26 January 2017. ^ The Eastern Chalukyas were originally of Kannada stock who later encouraged Telugu Dr. K.S.S. Seshan, University of Hyderabad. "APOnline-History of Andhra Pradesh-ancient period-Eastern Chalukyas". Revenue Department (Gazetteers), Government of Andhra Pradesh. Tata Consultancy Services. Archived from the original on 6 December 2006. Retrieved 12 November 2006. ^ Masica, Colin P. (1991). "Subsequent Spread of Indo-Aryan". The Indo-Aryan Languages. Cambridge University Press. p. 45. ISBN 0-521-29944-6. ^ a b c d e f "Group of Monuments at Hampi/Hampei". World Heritage. Retrieved 20 December 2006. ^ "And India's 7 wonders". The Times of India. 5 August 2007. ^ "Badami Cave Temple". Archived from the original on 1 February 2009. Retrieved 2 March 2009. ^ "Aihole Temple relocation". The Hindu. 20 February 2007. Retrieved 17 September 2013. ^ "Message with Long Life: Indian Inscriptions". Dr. Jyotsna Kamat. Retrieved 5 May 2009. ^ "Basavakalyan getting facelift". Hindu.com. 8 August 2007. Retrieved 17 September 2013. ^ "Kalyani Chalukyan temples". Templenet. Retrieved 17 September 2013. ^ Sharma, B.N.K (2000) . History of Dvaita school of Vedanta and its Literature. Bombay: Motilal Banarasidass. ISBN 81-208-1575-0. ^ OurKarnataka.com(OKC). "History of Karnataka - The Haridasa Movement". Ourkarnataka.com. Retrieved 17 September 2013. ^ "The Hindu Online". Hinduonnet.com. 10 February 2005. Retrieved 17 September 2013. ^ "Ornamentation in South Indian Music and the Violin By Gordon N. Swift" (PDF). Archived from the original (PDF) on 17 June 2013. Retrieved 17 September 2013. ^ Thielemann, Selina (2000). The Music of South Asia. New Delhi: A. P. H. Publishing Corp. p. 521. ISBN 978-81-7648-057-4. ^ OurKarnataka.com(OKC). "YAKSHAGANA - The music of celestial beings". Ourkarnataka.com. Retrieved 17 September 2013. ^ "Bharat Ratna for Vocalist Pandit Bhimsen Joshi". Rediff. Retrieved 21 February 2009. ^ "Padma Awards". Ministry of Communications and Information Technology (India). Retrieved 16 May 2009. ^ "About C. Aswath". Caswath.com. Retrieved 17 September 2013. ^ Manohar Laxman Varadpande (1992). History of Indian theatre, Volume 2. Abhinav Publications. p. 311. ISBN 9788170172789. ^ "Karnataka Folk Theatre - Imitation of the Divine". Indiaprofile.com. Retrieved 17 September 2013. ^ Special Correspondent (20 June 2011). "Harikatha sapthaha from today". The Hindu. Retrieved 17 September 2013. ^ News, Express. "20,000 devotees to get together for Shivratri". Newindianexpress.com. Retrieved 17 September 2013. ^ "Vasanthahabba from February 2". Online Edition of The Times of India, dated 2004-01-29. The Times Internet Ltd. 29 January 2002. Retrieved 12 August 2007. ^ Kavita Mandana. "A spring in their step". Online Edition of The Deccan Herald, dated 2004-01-17. The Printers (Mysore) Private Ltd. Retrieved 12 August 2007. ^ "About Bengaluru Habba". Bengaluruhabba.co.in. 22 January 2012. Retrieved 17 September 2013. ^ Details regarding Dasara Wrestling competition held in Mysore is provided by Shankar Bennur. "Dasara wrestling to offer 'thunder' bouts". Online Edition of The Deccan Herald, dated 2005-09-30. 2005, The Printers (Mysore) Private Ltd. Retrieved 4 April 2007. ^ "Karnataka Khadi Gramodyog Samyukta Sangh (Federation), Hubli". Khadifederation.com. Retrieved 17 September 2013. ^ "The living bard". Deccan Herald. Retrieved 17 September 2013. ^ : Prasad (19 September 2011). "ಡಾ. ಚಂದ್ರಶೇಖರ ಕಂಬಾರರಿಗೆ ಜ್ಞಾನಪೀಠ ಪ್ರಶಸ್ತಿ". Thatskannada.oneindia.in. Retrieved 17 September 2013. ^ "Government establishes Beary Academy". The Hindu. Chennai, India. 25 August 2007. ^ Hermann Mögling's contribution to the Kannada literature is mentioned by Shrinivas Havanur. 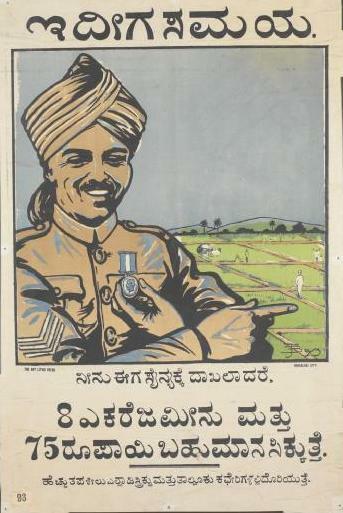 "Herr Kannada". Online Edition of The Deccan Herald 2004-01-18. 1999 The Printers (Mysore) Private Ltd. Retrieved 1 May 2007. ^ Shuma Raha. "Battleground Bangalore". Online Edition of The Telegraph dated 2006-11-19. The Telegraph. Retrieved 8 June 2007. ^ "Times Group acquires Vijayanand Printers". Online Edition of The Times of India dated 2006-06-15. Times Internet Limited. Retrieved 8 June 2007. ^ "Science centres planned at taluk and district levels". Hindu.com. 16 September 2005. Retrieved 17 September 2013. ^ "GDP contribution". Kar.nic.in. Retrieved 17 September 2013. ^ "Bureaucratic Corruption". Rediff.com. Retrieved 17 September 2013. ^ "Karnataka Sangha Mumbai". Karnataka Sangha Mumbai. Retrieved 17 September 2013. ^ "Mallige Kannada Balaga: Spreading Fragrance of Karnataka in Mauritius". Daijiworld.com. Retrieved 17 September 2013. ^ TNN 5 January 2002, 11.05pm IST (5 January 2002). "AKKA to host world Kannada meet in US from September 2". Articles.timesofindia.indiatimes.com. Retrieved 17 September 2013. ^ Raghu Karnad [@rkarnad] (15 July 2014). "#Kannadigas in #WW2! Joining up for the swag (8 acres & a Rs 75 salary). A full Lingayat battalion was raised in '41" (Tweet) – via Twitter. R. Narasimhacharya, History of Kannada Literature, 1988, Asian Educational Services, New Delhi, Madras, 1988 ISBN 81-206-0303-6. Rice, B.L. (2001). Mysore Gazetteer Compiled for Government-vol 1. New Delhi, Madras: Asian Educational Services. ISBN 81-206-0977-8. This page was last edited on 6 April 2019, at 18:53 (UTC).